The main threats will be large hail and damaging winds. A stormy Friday is likely across southern Minnesota. there is an increasing likelihood that leftover storms from overnight Thursday will continue across southern Minnesota on Friday morning. Some of those storms could produce hail and gusty winds before dissipating before noon. Stormy conditions are then expected to redevelop in the mid-afternoon hours, and the Storm Prediction Center&apos;s (SPC) current thinking – which will undoubtedly shift slightly over the next 24 hours – is that storms will begin in western Minnesota/northeast South Dakota. Large hail, potentially significant hail, will be possible in the first couple hours before a line of storms forms and marches across the state. 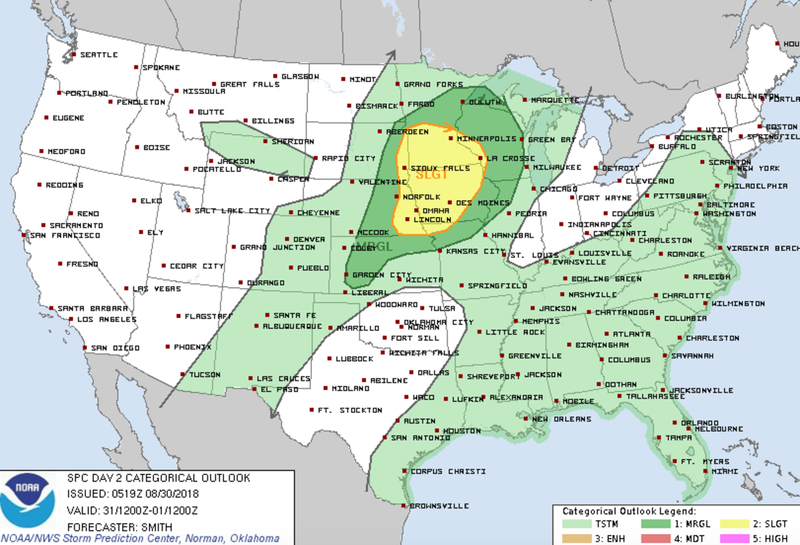 The SPC has the southern half of Minnesota under a slight risk for severe storms on Friday, as depicted in the map below. Anyone with outdoor plans on Friday evening/night will need to pay attention to potential stormy conditions. Friday is expected to be a very busy day at the Minnesota State Fair, and it&apos;s also the first game of the season for many high school football teams. This comes from the newest update from the Storm Prediction Center. Large hail, damaging winds and isolated tornadoes are possible.